Within the programming aspects of the Computing National Curriculum, there are many concepts that are a requirement to teach, and which form the basis of programming. Using the Crumble and Crumble software, it is possible to cover many, if not all of these concepts. Click on the following to learn more about the concept and see examples of them in action. Sequence – How your code is run in order from top to bottom, running each line in turn. Input and Output – Something taken in, or received by the processor/program, or something put out by the processor/program, often having a visible/audible effect. Repetition (Iteration) – Instead of writing out the same code again and again, you can repeat chunks of it. Selection – You may only want certain blocks of code to run if something happens (when a condition is met). Variable – Something given a name that has a value which can change e.g. testResults = pass or X = 42 etc. 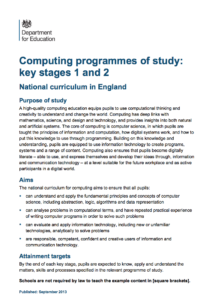 For more information about the Computing National Curriculum, visit here. Image used contains public sector information licensed under the Open Government Licence v3.0.